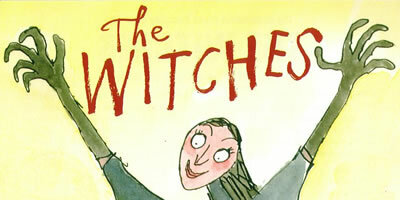 My adaptation of THE WITCHES by Roald Dahl opened at Birmingham Rep. on December 1st 2004. I was asked to answer some questions for the Rep's OFFSTAGE Magazine. Here are the questions and my answers! What inspired you to write plays for children? In my teens I performed magic at children's parties. I suppose that taught me something about entertaining children en masse. When I was at university, I went to a matinee of a big commercial pantomime, full of children. I noticed that there was little storyline, and that the glorified variety show on view didn't really appeal to children. The principal comedian cracked an off-colour joke, and when it got an appreciative cackle from some ladies near the front, came down to the footlights and said, "Let's get the kids out of here, then we can get started!" In the darkened auditorium I felt myself blushing! My hackles really did start to rise! How dare he show such disrespect to his audience. It led me to think about how little was available directly aimed at a young audience. This was the mid-sixties. Within a couple of years I was in rep at the Swan Theatre, Worcester, working as an actor and director. I was asked to organise Saturday morning children's theatre, and then John Hole, the artistic director, asked me to write a children's Christmas play. This turned out to be a not-very-good adaptation of Hans Andersen's THE TINDERBOX. But it was good enough for John to ask me to write more! Since then I have written about sixty more plays for children, and still find it a huge challenge. Did you go to the theatre as a child, if so what were your earliest / fondest memories? The first professional show I ever saw was PETER PAN in London, which I absolutely loved. I suppose I must have been about six. The following year my parents offered me a choice of several shows, but I insisted on seeing PETER PAN again! I think most children are somewhat conservative. They like repetition, particularly when it involves something they liked a lot! For some reason, the image that has stayed with me is Smee working away at his sewing machine! When I was about eight I saw an amateur production of CINDERELLA, with the local vicar playing one of the Ugly Sisters! I always remember the extravagant use of huge props, like an enormous comb and pair of scissors. Indeed the use of scale has been a predominant feature of my plays. THE PLOTTERS OF CABBAGE PATCH CORNER is set in a garden, with insect characters and a vast cabbage and oversized flower pot! THE SELFISH SHELLFISH takes place in a rock pool, in which shellfish characters live amongst human litter, including a baked bean tin and a flip-flop. And in THE WITCHES, when Boy and Bruno are turned into mice, the scale increases so we see things from a mouse's viewpoint..
How easy or hard is it to adapt books for the stage? I see adaptation as a craft. It is not simply a case of plucking the dialogue from the book and sticking it on the stage! The structure of a play is very different from the structure of a book. I try to be faithful to the book and its author, while sometimes changing the running order of events, omitting scenes or characters, or even inventing new ones. The story has to be made to work in theatrical terms. Action as well as dialogue is important. Getting from one scene to another must be smooth. The whole process must be logical, with lots of excitement, use of theatrical tricks like sound, lighting, music and, in the case of THE WITCHES, stage illusion. I particularly like using magic, because it takes me back to my conjuring roots! Some plays can patronise children – how do you get round this? By telling the story honestly and excitingly, and never underestimating children's ability to understand. Most children, if the story grabs them, pay far more attention to what is going on than adults. The amount of detail that children remember is admirable. Just look at the drawings and paintings they often send in. Quite honestly, I write the play for myself. I don't necessarily think about the children in the audience. Having said that, I think I do have some sort of antenna which tells me how children are likely to react to things. Sometimes - though not in THE WITCHES- I use audience participation, and actually give the audience lines in the printed script! Some people think this is very arrogant behaviour! But I believe it is my job to know how the audience will react to certain situations. The director and the actors can play their part too. They should play the story "for real", take it seriously, and not think that children only enjoy hearing silly voices and seeing people fall over! There is a strange misconception sometimes that everything in a children's play has to be unnaturally jolly! What do you think is the secret to keeping children entertained and on the edge of their seats? This has become my credo ever since a Canadian children's book publisher told me the story of her eight year old daughter, who greatly enjoyed a book, and on being asked why, simply answered ....."lots of suddenlies". Theatre suddenlies include new characters coming on, new ideas being introduced, a music cue, a sound effect, a lighting change, a magical happening etc. etc. When I am writing I actually count the number of suddenlies on each page! The aim is to make it absolutely impossible for the audience to want to take their eyes off the stage, for fear of missing something! How do you keep in the scary bits without terrifying the children? Very few children get scared in the theatre, unless they are younger than the recommended attendance age. It is human nature to enjoy being scared a little, even a lot! The great thing about theatre is that you can be scared within a safe environment. Most fairytales are pretty frightening. Look at RED RIDING HOOD! Far better for children to learn that the world isn't always a happy place by reading a story or watching a play, rather than experiencing genuinely scary events in real life. Roald Dahl was an extremely moral writer. His child heroes and heroines always defeat the representatives of evil or unfairness. But the audience, in order to experience the cathartic joy of triumph over villainy, need to be shown the nasty things that need punishing! Do you think every child should be taken to the theatre by their school every year as part of the curriculum? Ideally it should be free! I believe that there are certain things that should be a child's right - free library books, learning to swim, things like that. And going to the theatre is one of them. The arts are as important as eating and drinking, in my opinion. The triggering of the imagination leads to creativity, which every child needs. I believe we all have an imagination muscle that will not develop unless it is exercised. The theatre is a wonderful place for this to happen. The school curriculum needs radical rethinking, to include the arts - music, drama, painting in particular. A teacher at an infant school, explaining to me how even three-year olds were working towards the dreaded tests, said "We don't have time for fun anymore". This struck me as a very sad reflection on our education system. Any anecdotes from previous productions of The Witches? As the director of the original production of THE WITCHES, I remember the complicated planning pre-production stage with particular pleasure, even though there were so many problems to overcome! Working with magic and puppetry was really exciting. How on earth were we going to make fifteen witches disappear? And how would Boy and Bruno turn into mice? The recruitment of local amateur actresses to play witches in every city we played was unforgettable, too. Several auditionees were so keen, they actually had their heads shaved, having read in the book that Dahl's witches don't have hair!Several witches took the trouble to write to me to tell me we had given them the best week of their lives. Another really exciting thing for me was taking the production into the West End, not least because we played at the Duke of York's Theatre, where, in 1904, PETER PAN first played! What was a real surprise was to find that the stage of the Duke of York's is really quite small. How on earth they fitted on all the varied scenes of PETER PAN is still a mystery to me. There’s lots of magic in the show – what was the most difficult part of The Witches to adapt for the stage? I suppose it has to be near the end of the book/play, when lots of witches disappear and the Grand High Witch is defeated. It's a wonderfully theatrical idea on the printed page. Making it happen convincingly on stage was a real challenge. How easy or difficult was it to capture the essence of Roald Dahl’s characters? 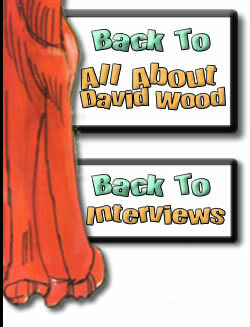 The characters don't present huge problems, because Dahl writes splendidly theatrical characters, particularly baddies! Everything in THE WITCHES has a heightened reality, which leads to a very plausible fantasy situation. There is broad humour in the depiction of Bruno and his somewhat vulgar parents. But this is balanced by the very warm and affecting relationship between Boy and his Grandmother. The strength of their love, and the way they become a troubleshooting double act provides the main anchor of the story. Dahl also writes very colourful dialogue, some of which comes straight off the page and into the play! Jonathan Church is going to have the task of recruiting 15 local amateur actresses to play witches. What do they have to do and how would you persuade somebody to take part? They have to attend the annual English Conference of Witches, and respond with great awe and excitement to the exhortations of the Grand High Witch. They work very much as an ensemble, shouting out impassioned responses and intoning the sinister "Down with children, do them in" rhyme. Any local actresses who would like the chance to be really evil need look no further! Have you worked with Jonathan Church before? No, but I have admired his work in Birmingham and elsewhere. And I was flattered to learn that one of his early theatre-going experiences was to see my play THE PLOTTERS OF CABBAGE PATCH CORNER. This, he says, made him want to work in the theatre! Did you ever meet, Roald Dahl? Did he ever see any of your stage adaptations? In 1990 I was in a hotel room in Hastings, writing my adaptation of THE BFG. One of the games I play with myself, in order to keep me tethered to the writing desk, is to ration the amount of television I watch! When I got to the helicopter scene, quite near the end of the play, it was about six fifteen in the evening, and I allowed myself the treat of watching some of the early evening news. At the very moment I turned on the television, the newsreader announced that Roald Dahl had died earlier that day....a very spooky moment, I can assure you! I sat in the darkening hotel room for a couple of hours thinking about him, and hoping that he would like the way that I was adapting his book! But sadly he was never able to see the production. However, his widow, Felicity, known as Liccy, came to see it and said extremely encouraging things about it. Since then I have been privileged to adapt not only THE WITCHES, but also THE TWITS, FANTASTIC MR FOX, JAMES AND THE GIANT PEACH and DANNY THE CHAMPION OF THE WORLD. The more I adapt Dahl the more I admire his skill as a story teller. He knew all about "lots of suddenlies"! You were awarded the OBE in the Queen’s Birthday Honours this year and numerous productions of your stage adaptations are been presented in theatres across the UK all year round. What would you like to achieve next? I just want to continue writing and directing plays for children. Some practitioners see working in children's theatre as simply a stepping-stone towards working in adult theatre. I have never seen it that way. I have no particular desire to write for adults. The challenge of writing for children is as great as it ever was, and as rewarding when I get it right! I would also like to write more children's books. And I wouldn't mind doing a bit of acting again! .